In an increasingly competitive marketplace that has seen the consumption of both alcoholic and non-alcoholic beverages grow rapidly, producers must have highly flexible and sustainable processes. Pentair helps its partners meet these challenges with its advanced Food & Beverage products, technologies and services. With strong brands like Haffmans, Südmo and Pentair. Higher costs for raw materials, utilities and logistics force brewers and beverage producers in virtually every geographical area to change their investment philosophy. Pentair helps simplify manufacturing and helps make it more efficient with products and integrated solutions that help maximize performance and resource conservation. The food & beverage industry has passed the sustainability point of no return. Pentair‘s Food and Beverage Processing Solutions focus on helping minimize energy, water, and raw material consumption, providing industry-leading solutions that fit the ever-increasing requirements. In an industry that demands uncompromising standards of safety, sanitation, and performance, Pentair is at the forefront of innovation. Pentairs’ process valves, components, and filtration products meet stringent hygiene standards and create engineering designs that help protect critical assets and thwart problems before they start. Pentair offers end-to-end solutions for the food and beverage industry. For Pentair’s customers, this means more time and resources directed where they should be: making the food and beverages to nourish a rapidly growing planet. 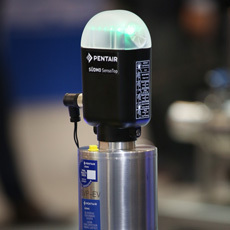 Pentair plc delivers industry-leading products, services and solutions for its customers’ diverse needs in water and other fluids, thermal management and equipment protection. With 2014 revenues of $7.0 billion, Pentair employs approximately 30,000 people worldwide.